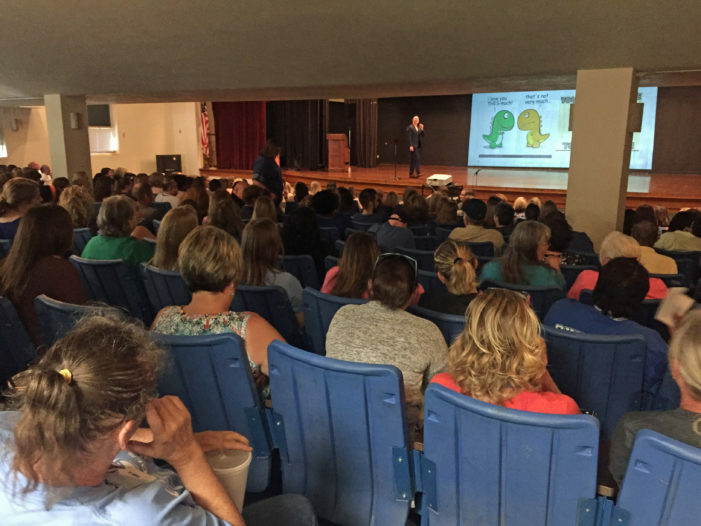 Teachers and staff throughout the district filled the Junior High auditorium after taking in some coffee and doughnuts provided by Guthrie North Church. The Guthrie High School marching band provided entertainment, including the national anthem with the aid of the GHS JROTC. Steve Hanna spoke on behalf of the Guthrie Education Foundation and was followed by each school’s principal who introduced their new personnel. In total, the district has 43 new certified teachers and 17 new support staff members. District Teacher of the Year Audra Branson and Superintendent Dr. Mike Simpson spoke to all the district teachers, administration and support staff. Jim Van Allan, a speaker and trainer, spoke on school culture and leadership. Afterwards, teachers met for a ratification of negotiated agreement. The first day of school is set for Tuesday, September 4.